Discover over 500 fantastic objects to match and interact with. Freely drag objects around the beautiful world and match 3 of a kind evolve them into better things! Match nearly anything – plants, buildings, coins, treasures, fallen stars, magic objects, mythical creatures, and more! Match Life Essence and tap it to unleash power to heal the vale! Discover the Gaia statues stuck in each level’s cursed land. Match them to solve the puzzle and create life! Discover 17 dragon breeds who live in the vale, and evolve them through 8 growth stages for new dragons! Match eggs to hatch helpful dragons who will roam the vale and harvest objects for you to use or match. Over 600 quests to challenge your mind! 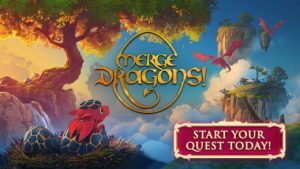 Test your puzzle solving skills in more than 140 tricky levels filled with new quests and rewards to help you build your dragon camp! Discover hidden levels – can you find them all? On your puzzle journey, you may cross paths with evil Zomblins. Watch out and be careful!